Kune kune’s are one of the smallest breeds of pigs and were originally kept by the Māori people of New Zealand. Our pigs are very clever and will collect their bowls when they’ve finished their meals and even sit when asked to. They are very affectionate and love their keepers very much, though they can be a little shy around new people. Sometimes they can be too friendly, and will happily allow the magpies to pluck hair from their backs for nest making. 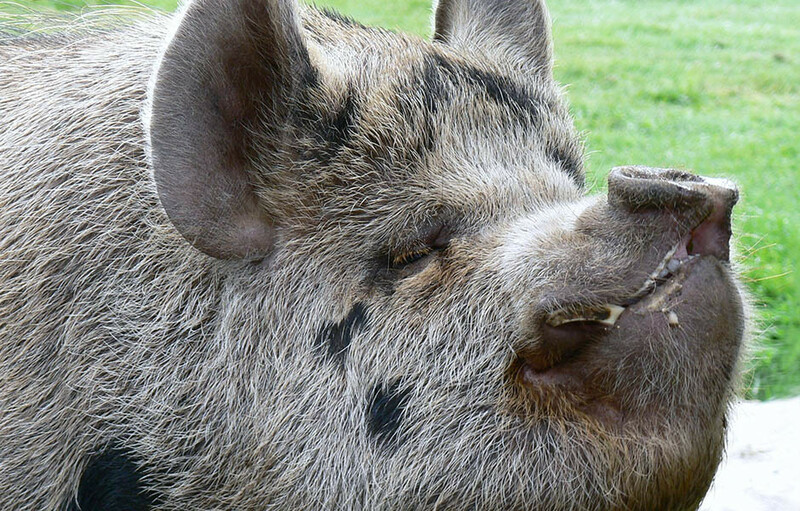 Marlon, the most charismatic kune kune, particularly likes the Windsor the peacock, and on hot summer days you might spot them sat with each other. Our herd of seven goats are far fussier with their food than people think. In fact, they are on a special diet of grains, vegetables and hay to keep them healthy. Goats are one of the first animals to be domesticated by humans, around 11,000 years ago. The zoo’s Africa pygmy goats originate from the Cameroon Valley in West Africa.